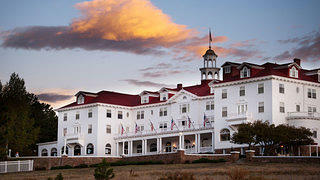 The Stanley Hotel in Estes Park, Colorado, was the inspiration for Stephen King's novel "The Shining." As a new year starts, one of the things I always like to think about is where I might want to travel in the coming months. Unsurprisingly, I am a big fan of traveling to historic places, and of staying—when possible—at historic hotels. Or, more specifically, at members of Historic Hotels of America, our program for accommodations that have maintained their "historic integrity, architecture, and ambiance." In addition to being lovely places to stay, and chock-full of their own stories, many Historic Hotels have also served as a source of inspiration for generations of writers, filmmakers, and artists. The books and films, either set in these locations or influenced by them, are the perfect way to get thinking about your historic travel plans for 2018. If the classic western novels of Louis L’Amour are your cup of tea, you can walk in his footsteps at Colorado's Strater Hotel, where the author often stayed while writing. According to hotel staff, he usually reserved rooms 222 and 223 to work on his books. Whether you're a reader or a movie fan, there's a Historic Hotel connection to Stephen King's horror classic "The Shining." King has said Colorado's Stanley Hotel was the inspiration for the fictitious Overlook Hotel in his 1977 novel, while filmmaker Stanley Kubrick used the Timberline Lodge in Oregon as the exterior of the hotel in the movie a few years later. Filmed at Grand Hotel in 1979 and released the following year, the romance "Somewhere in Time" has so enchanted viewers that the hotel has been hosting fan weekends in its honor for nearly 30 years. Starring Jane Seymour and Christopher Reeve, this time travel tale is perfect to share with a sentimental sweetheart. Fans of the Coen Brothers' movies can find their way into a scene from "No Country for Old Men" at The Plaza Hotel in Las Vegas, New Mexico. The hotel's Victorian lobby provided the setting for a confrontation between Javier Bardem and Woody Harrelson. Though James Fenimore Cooper's "Leatherstocking Tales" long predates the Otesaga Hotel, and the wilderness of the book is now the bucolic farmland of Upstate New York, the Glimmerglass Lake featured in the book—Lake Otsego—remains as beautiful, restful, and yes ... inspirational today as it was in Cooper's day. 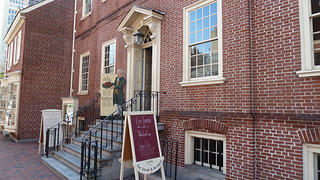 City Tavern in Philadelphia is home to Chef Walter Staib, winner of the Historic Hotels of America 2017 Historian of the Year Award. Bring a taste of history into your home courtesy of the winner of the Historic Hotels of America 2017 Historian of the Year Award, Chef Walter Staib of Philadelphia’s City Tavern. His cookbooks, The City Tavern Cookbook: Recipes from the Birthplace of American Cuisine and its dessert-focused follow-up Sweet Taste of History: More Than 100 Elegant Dessert Recipes From America’S Earliest Days, offer delicious ways to connect with the past. Looking for Historic Hotel accommodations near City Tavern? The AKA Rittenhouse Square is a short cab ride or a 30-minute stroll away. The Menger, located just steps from the Alamo, has another claim to fame: it was the location where Theodore Roosevelt recruited the Rough Riders, heroes of the Spanish-American War. The Rise of Theodore Roosevelt—the first of a biographical trilogy—covers this period of his life. This may be a bit of a cheat, as the historic hotel and the movie share only a name, but Moana is delightful—for both kids and kids-at-heart—and evokes the beauty of Hawaii perfectly. Once you’ve watched, you’ll know how far you’ll go to spend time on these beautiful islands, and its namesake hotel might be just the place to stay. For more than 40 years, Eloise’s adventures living in New York City’s Plaza Hotel have delighted children young and old. She runs through her unusual home as only a six-year-old can, by creating imaginative adventures and leaving chaos in her wake. And while we’re exploring historic hotels, the story of the marching ducks at the Peabody Hotel in Memphis makes for a delightful children’s book. Using what’s known of the origin of the unusual attraction, author Patricia Polacco spins the tale of a boy named Edward and the orphaned duck he trains to march to the tunes of John Philip Sousa. As a member of the National Trust for Historic Preservation, you receive up to 30% off best available rates at the participating hotels. Book your rooms through HistoricHotels.org to receive this special Member rate. Subject to availability. Book now. By purchasing any books or movies using the links on this page, you'll be supporting the National Trust. A small portion of the sales comes back to us to support our work. Looking for other ways to support preservation? Consider giving a gift membership to the place-lover in your life.